I’ve never quite been sure what to make of Craig Vetter. One the one hand, he’s the man who gifted us the Triumph X-75 Hurricane and helped create the Triumph T160. On the other hand, he’s responsible for the Windjammer fairing (and worse). So is Vetter a visionary, or is he one wave short of a shipwreck? I’m inclined to err on the side of visionary, because he designed the 1980 ‘Mystery Ship’. 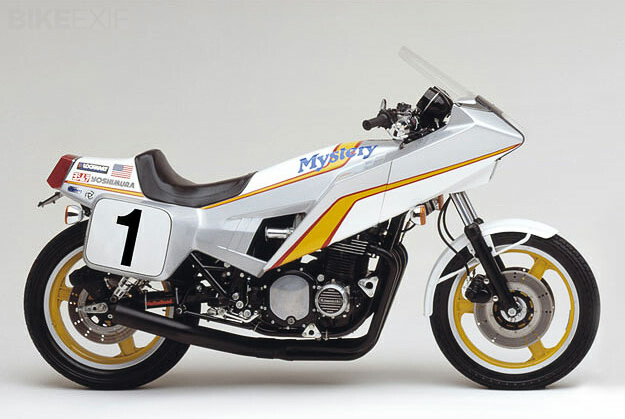 Just ten of these Kawasaki KZ1000-based superbikes were built, and if you think the fiberglass styling looks outrageous today, imagine the impact it had thirty years ago. Underneath the Flash Gordon aesthetics were a reinforced and cleaned-up frame with a repositioned steering head, a new swingarm and rear suspension set-up, magnesium Dymag wheels and a Yoshimura four-into-one pipe. It’s still a showstopper today.